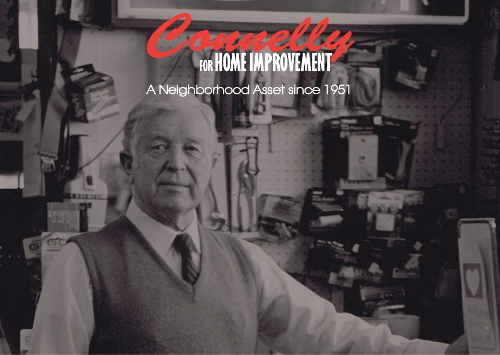 In 1951 a young Brookline couple, John and Irene Connelly, bought Carlo Hardware and changed the name to Connelly Hardware. For the next 45 years, they worked to make Connelly’s become an integral part of the community. Both John and Irene were born and raised in Brookline, went to Brookline High School, and were much beloved. They worked very hard to make Connelly’s what it is today, the oldest retail store in Brookline and a fixture in the charitable and business community. In 1996, John and Irene were ready to retire and sold the store to their daughter Kathy (Connelly) Kenney. Kathy started working at Connelly’s in the mid-1980’s and is still working there today. Her son Brendan, who worked in the store as a teenager in the 1980’s, now manages the store as well.